>Bamboo is a member of the grass family . However, as a hardwood floor, it is surpisingly harder than red oak. It is harvested with no harm to their natural habitat, and produces materials that promote a healthy human environment. For convenience and durability, Natural Cork's Bamboo flooring is pre-finished with an unsurpassed aluminum oxide finish containing 6 coats applied to the flooring surface offering superior wear resistance. 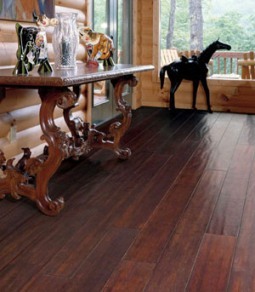 These floors come in both solid and engineered construction in the traditional natural and carbonized finishes. Natural Cork took it a step furthering by introducing stained bamboo as well as handscraped. 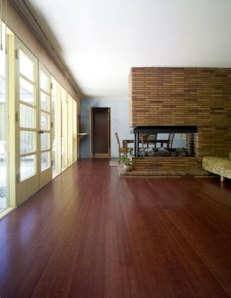 With its superior quality, unique look and environmental consciousness, these bamboo floors are the smart choice for any home. Natural Cork's handscraped bamboo hardwood flooring is now available in both solid and engineered construction. At last you can have beautiful bamboo floors anywhere in your home! Available in an array of stunning colors, these unique floors have micro beveled edges & ends, 6 coats of aluminum oxide finish and include a 25-Year Limited Residential Warranty.